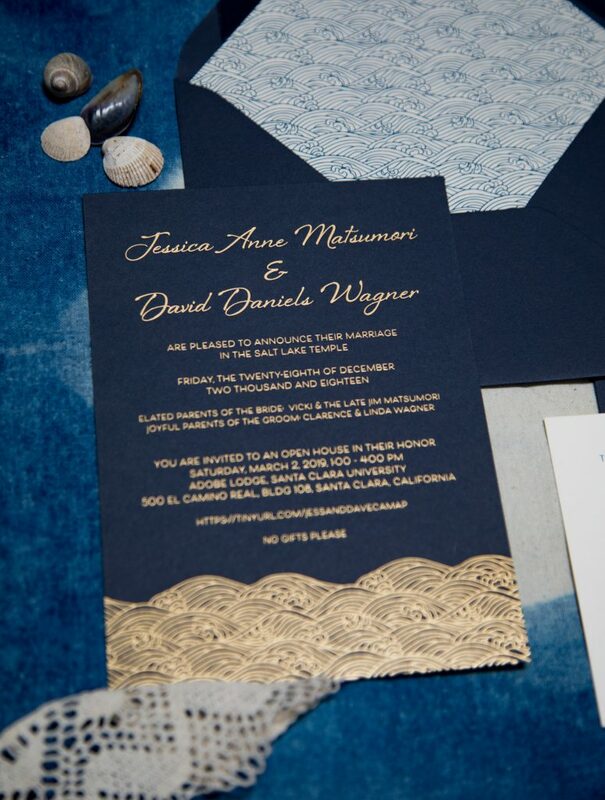 This gold foil wedding invitation, printed on a deep navy blue paper, draws inspiration from traditional Japanese design. It is one of the flagship designs in our collection of customizeable luxury wedding invitations, Dependable Weddings; read on to learn a little more about its features and the design process! Jessica, for whom Seigaiha was originally designed, wanted to bring various Japanese elements into her wedding celebration, to honor her heritage. Her bridal gown featured a traditional silk obi, for instance. Her cake was decorated in a delicate pattern of waves, known in Japanese as seigaiha, and she wanted her invitation to echo that same pattern. The color scheme of gold foil and deep navy is straightforward and classic. 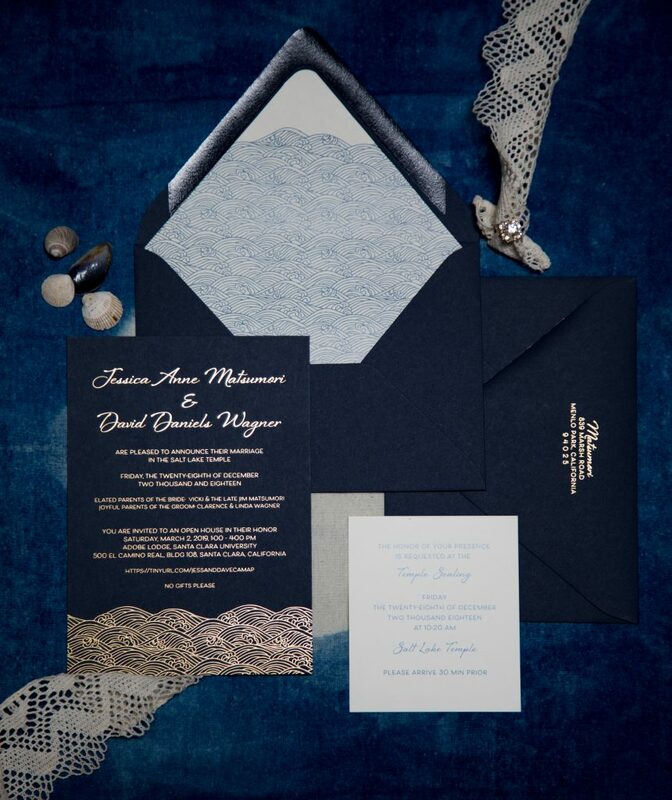 For anyone wanting to bring an oceanic theme into their invitations, without going overboard with nautical touches, Seigaiha is a great option. Of course it was designed with the sea in mind, but the formality of the pattern keeps the theme from being overwhelming. The design for this invitation needed to accommodate an unusually large amount of text on the announcement card. We wanted it to have a certain amount of visual interest, but avoid overly flowery calligraphy. The bride wanted it to be somewhat understated, but not severe or minimalist. For the couple’s names we chose a font which gave the feeling of brush lettering, without being too wild or casual. The text font, while a sans serif, is a bit more unusual. It features some light curves and idiosyncracies, and has a soft charm. Rather than being printed in gold foil, the enclosure cards are digitally printed in navy blue on ivory stock. Digital printing is a great option for enclosure cards, especially when different guests receive different combinations of enclosures. Incorporating digital printing alongside letterpress or gold foil, helps when the timeline is aggressive or the budget is constrained. If you only need a small number of rehearsal dinner invitations, for instance, the setup costs of printing in gold foil or letterpress can be prohibited. With thoughtful design, the digital pieces don’t necessarily have to detract from the letterpress or foilstamped portion of the suite. Instead, they can make sure the focus is on the announcement card, highlighting and elevating it. Seigaiha also features an optional, digitally-printed liner with the same wave pattern, rendered in navy blue on ivory stock. The ink and paper of the liners matches the enclosure cards. The way the liner is laid out makes it appear as if the waves are lapping at the top of the envelope flap. This also left room for the original bride’s hanko stamp, which she added herself as the invitations’ finishing touch. The return address is printed in gold foil on the flap, tying the envelopes back to the announcement card. Like all the suites in Dependable Weddings, Seigaiha has coordinating designs for thank-you cards and various day-of items, which are available by request. For more details, and to shop this design as well as our other customizeable wedding invitations, click here. We provide transparent pricing for all of our suites, but if you are interested in further customization don’t hesitate to get in touch. We happily provide quotes for additional customization if desired. If you, like Jessica, have a specific and detailed vision for your wedding invitations, we can also help bring that vision to life. Click here to learn more about our fully custom wedding services. This suite was designed by Annemarie Munn of Lady Bones Print Co. for Dependable Letterpress.